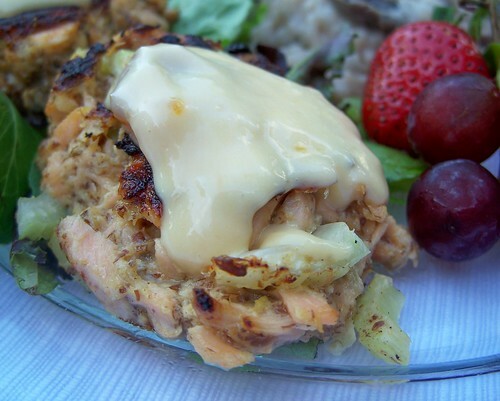 Last week I intentionally bought a large salmon fillet so we could have salmon cakes from the leftovers. 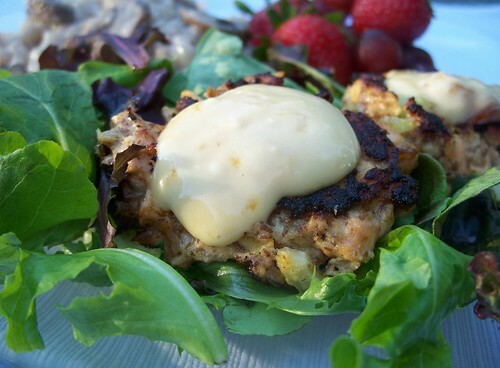 Usually I make my salmon cakes like I make crab cakes, although I often leave off the hazelnuts and generally make tartar sauce rather than berry sauce. Because I used the orange marmalade glaze on the entire salmon fillet, I decided to go a slightly different route with the leftovers and made a funky apricot-ginger aioli wanna-be to go with it. I also made a mushroom risotto, a first for me, which was average, not stellar but definitely edible. 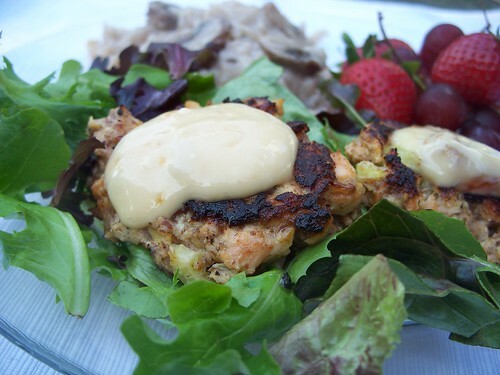 I served the salmon cakes and risotto with some fresh greens and fruit. Another nice meal for grownup tastes. Mix all ingredients. Shape into patties. Cook on hot, greased skillet or grill about 2 minutes per side or until browned. The four Tartlets have gone with The Husband’s Parents on a little adventure to eastern Montana. We’ll follow them next week and rendezvous at the family reunion for The Husband’s maternal side of the family. Until then, we are footloose and fancy free for nearly a week. This is the time that foods that little tastebuds don’t appreciate or seem too expensive to buy for 6 people begin to appear on our menu. Last night I made a nice dinner for us using a recipe I pulled from the Sunday paper years ago. 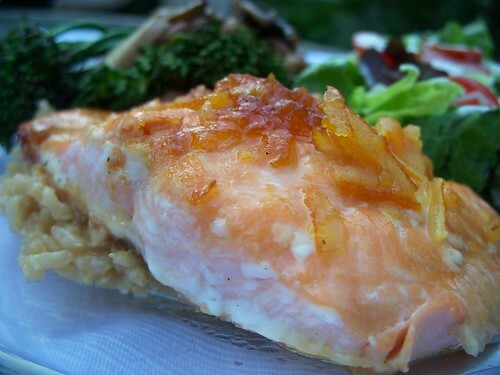 While salmon is The Husband’s favorite seafood, this Asian orange glaze is not his favorite preparation (but it is *mine*). He likes it grilled with just a little lemon juice and served with tartar sauce. I didn’t have quite enough orange marmalade on hand so I ended up using about 2/3 orange marmalade and 1/3 apricot preserves. It was very good. I didn’t have the scallions on hand, but it makes the salmon look pretty if you use them. 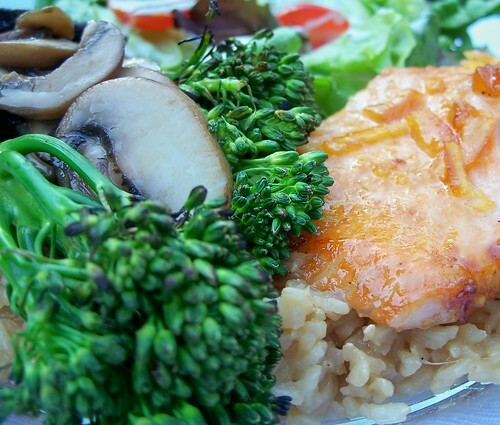 To serve with the salmon, I made brown rice similar to this, using chicken broth, soy sauce, and pineapple juice for the liquid and adding both garlic and ginger to the pot. I grilled some broccolini (baby broccoli) drizzled with lemon juice, just until it was bright green but still crisp (about a minute on each side), and sauteed some baby portabella mushrooms to go with it. I was first introduced to broccolini at The Great Impasta and love it, which is surprising considering that I really don’t love broccoli at all. However, it tends to be rather expensive so I rarely buy it. It made a nice treat for an adult meal. Combine marmalade, oil soy sauce, ginger, garlic and vinegar. Heat grill. 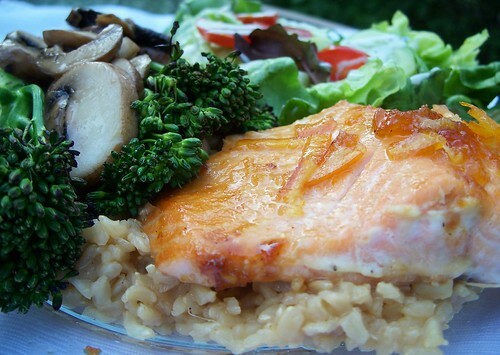 Brush orange glaze on each side of salmon and grill about 5 minutes on each side. Top with scallions and sesame seeds and serve. This can also be done with the skin on, just lay the fish skin side down on foil on the grill or in the oven (350 F) and spread with glaze. When the fish is cooked and tender, slide a spatula between the meat and skin, lifting the meat off the skin.